A rich, magical journey of redemption by celebrated First Nations writer, Tomson Highway. Seven women – all related – leave their reservation on a road trip to Toronto and the “Biggest Bingo in the World”, each hoping to win the jackpot and change their lives forever. Audience advice: This performance contains strong language, mature content, and the use of stage haze. Upstage Magazine – an insider’s guide to the Belfry. 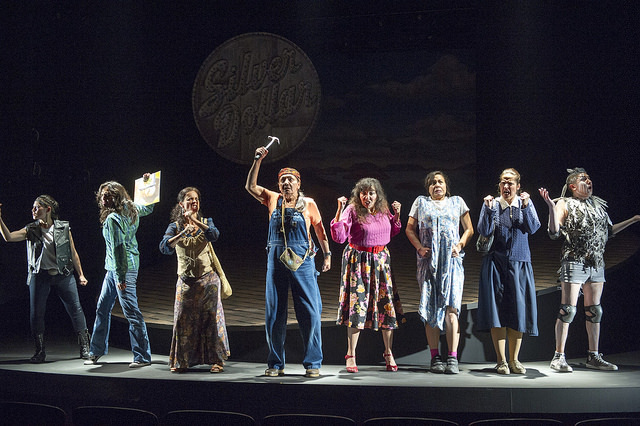 Inspired by Michel Tremblay’s play Les Belles-soeurs, Tomson Highway’s The Rez Sisters introduces us to seven women, all related either by blood or marriage, living on the fictional Wasaychigan Hill Indian Reserve on Manitoulin Island, Ontario. As we get to know each woman’s unique personality and perspective on life, we gain insight into their lives on the reservation, their relationships with one another, the personal demons they struggle with, and the humour they use to rise above it all. When they find out about “The Biggest Bingo In The World,” to be held in Toronto, they embark on an eventful and challenging roadtrip, each dreaming of winning the jackpot and what life-changing fortunes it will bring them. Throughout the play, the women are followed and observed by the “trickster,” Nanabush, who we will recognize in several forms throughout the women’s journey. Our sisters return to the Reserve with a renewed understanding of themselves, each other, and where they live. Single Tickets from $23 – $48. Student and Senior discounts available. Call 250-385-6815 or click on the button above.